Maheshwar is located in the Khargone district of Madhya Pradesh on the north bank of the Narmada river. The ancient city finds considerable place and popularity in the ancient Hindu scriptures and was known as the ancient town of Mahishmati. The Nishada King Nala, who once ruled over Mahishmati, had received the boon from Agni (the god of fire) that the kingdom would be protected against any invasion. During the late 18th century, Maheshwar served as the capital of the Malwa region ruled by the Marathas. Rani Ahilya Devi Holkar later on embellished the entire city with marvellous architecture and palaces which stand to this day attesting the rich heritage of the area. Maheshwar faces the wrath of the summer sun with a dry atmosphere. Monsoon is pleasant; however, high humidity makes the visit uncomfortable. Winters are the best in Maheshwar. The temperature is moderate and cool. Mornings might be chilly but the day gleams in the warm, bright sunlight. Festivals which are celebrated with grandeur in Maheshwar, like Shivratri and Diwali, also occur during winters. Maheshwar is roughly 405 km from Ahmedabad and is easily accessible by all modes of transport. A road trip to Maheshwar is thrilling, comforting and filled with landscapes that are lesser known to the outer world. The road to Maheshwar can be covered by three major routes. Route 1: Ahmedabad - Godhra - Dahod - Jhabua - Dhar - Dhamnod via the NH47. The distance via this route is 403 km. Route 2: Ahmedabad - Nadiad - Vadodara - Bodeli - Alirajpur - Manawar - Khalghat via the GJ SH 11. The distance via this route is 407 km. Route 1 is the preferred route. The roads are wide with less traffic along the NH. The journey is also comforting as it passes through some spectacular places of Gujarat. Balasinor is about 90 km from the city of Ahmedabad. Known for its commercial activities during the era of Yousafzai Pathan, the architectural heritage of Balasinor is conserved till date. Balasinor is also known for its Jurassic era discoveries, the fossils. A fossil park has been constructed at the Raiyoli village that takes inspiration from the Jurassic age. The park houses unearthed fossils of giant mammoths and dinosaurs. It is advised to plan the visit earlier as the park safari consumes more than half of the day. Stay is available nearby. Many temples are also located nearby like the Ambaji Temple. There is also a hot water sulphur spring of Timba Tuva. Folklore says it is the site where Bhima was married and his footprints are still preserved on the rocks attesting the belief. Dahod is 119 km from Balasinor. It is the place where the mighty Mughal Emperor Aurangzeb was born. River Dudhimati lies on the east side of Balasinor. The primitive Bhil community still preserves the ancient tribal heritage of the place living in harmony with nature. Their inhabitation gives a spectacular rural view along the Mangadh Hill. The hill area is filled with luscious vegetations and acts as a stimulant for the mind and body. The Ratanmahal Bear Sanctuary, which is well known for its ardent conservation program, is located nearby. The famous Shiva temple of Devzari Mahadev is located close to the highway and is flocked by devotees round the year. Dhar is located at a distance of 132 km from Dahod. The ancient city lies close to Mandu and passes through majestic hills that give a mesmerising view during the rainy season. The road also passes through a number of lakes that inhabit the outskirts of the city and are known for their spectacular appearances. The city houses the Lath Masjid or the pillar mosque, which was built by Dilawar Khan in 1405. The pillars are dismantled but still preserve the architectural heritage of the place. The inscriptions are valuable and contain the declaration of Akbar when he visited the place in 1598 while campaigning in the Deccan. Original stone footing of the pillar is also displayed. 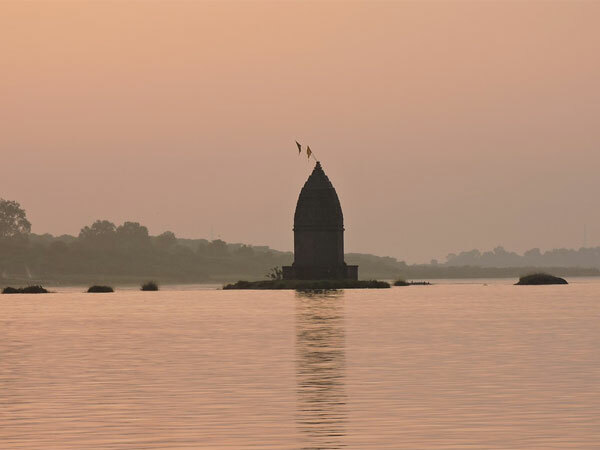 Maheshwar is actually a holy destination enshrined by the historic temples that were built hundreds of years ago. In addition, the city is flanked by beautiful ghats, cenotaphs, palaces and forts. There are a total of 28 ghats along the Narmada river along with numerous holy temples and shrines. The 16th-century fort was built by Rani Ahilyabai Holkar and was made to signify fortification from invasion on the banks of river Narmada. The river looks spectacular from the fort and has sunset points on the roof. Boating and sightseeing are available near the fort. While at this fort, keep an eye out for Ahilya Mata's Cenotaph and the royal ghats, which make for a famous shooting location. Constructed by Anand Raj Parmar during the 5th century, it is a small temple on a mud island at Narmada river and rises atop a rock. The island is easily accessible by boat. It is believed that a heavenly line from the North Star passes exactly through this temple along the centre of the earth. The temple is also called Shiva Datta Dham and is located in Sahastradhara Jalkoti. The temple area is a beautiful place spread over 30 acres and is best to have a walk around with your family. The serene atmosphere is perfect for a peaceful experience. The temple is dedicated to Lord Shiva. The temple houses the 11 akhand jyoti deepaks (fire lamps). The place is majestic in appearance and houses marvellous sculptures inside. It is a perfect place to enlighten oneself with ancient religious knowledge. Also known as Sri Somavamsha Sahasrarjun Temple, the Sahastrarjun Temple was rebuilt in the 13th century after it was destroyed by foreign invasions during the 2nd century.